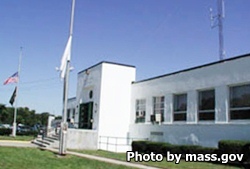 Massachusetts Correctional Institution Cedar Junction, called MCI Cedar Junction for short, is located in South Walpole Massachusetts. It is a maximum security prison that houses adult males who are often violent and have long sentences. This prison also houses the Departmental Disciplinary Unit which is where inmates who are difficult to manage are incarcerated. In addition, this facility is responsible for the reception and diagnostics of all adult males in the state. This intake process consists of mental and physical evaluations of the inmate, at which time the inmate is classified, a process that usually takes twelve to sixteen weeks. A report containing suggested treatment programs and counseling will accompany the inmate to his new more permanent location, although sometimes inmates may be placed in a permanent position at Cedar Junction. Offenders at Cedar Junction can also work in the manufacturing of license plates for the state, and earn a menial wage. In addition to work programs, this facility offers substance abuse treatment, anger management, fitness, and parenting programs. When you arrive at the facility you will take a number from the dispenser, then fill out a visitation request form. The day and time your inmate is allowed visitation will depend on the inmates housing unit. Attorneys can visit anytime and the following schedule does not apply to them. B2, B3, B7 and Orientation Housing Units have non contact visitation on Mondays and Wednesdays from 1pm-8:30pm. They also have visiting on Saturdays from 5pm to 8:30pm. A1, A2, A3, B1, B4, B5, B6 and B8 have contact visits on Sundays, Tuesdays and Thursdays from 1pm-8:30pm and on Saturdays from 1pm-4pm. BMU inmates are allowed scheduled visits only. Visits must be scheduled at least 24 hours in advance, but no more than seven days in advance. Call the BMU officer to schedule a visit at 508-660-8000 ext.158 Monday-Friday 8am-2:30pm and 6pm-9pm. The visiting hours at the BMU is Monday-Friday from 6pm-7pm and from 7:30pm-8:30pm, and on Saturdays and Sundays from 10am-11am, 6pm-7pm, and 7:30pm-8:30pm. Ten Block can have two visits per week by appointment only. You must schedule at least 24 hours in advance by calling 580-660-8000 ext.130 between 8am-2:30pm daily and telling the operator you are scheduling a visit for an inmate on Ten Block. The visiting hours for Ten Block inmates are Sundays, Mondays, Wednesdays, Fridays, and Saturdays at the following times 8:30am-9:30am, 10am-11am, 1pm-2pm, 2:30pm-3:30pm, 6pm-7pm, and 7:30pm-8:30pm. DDU inmates can have up to two adult visitors and two children under 14 visitors at a time. Visits are non-contact and one hour in duration on Sundays, Mondays, Thursdays, Fridays, and Saturdays from 9am-10am, 10am-11am, 1pm-2pm, 2pm-3pm, 6pm-7pm, and 7pm to 8pm. Tuesdays and Wednesdays are for attorney visits only.